One week. Manchester, Liverpool, and Newcastle-upon-Tyne -- all in the north of England. Old stadiums full of history, cherished clubs known around the globe, and a change from the typical London-centric visit. 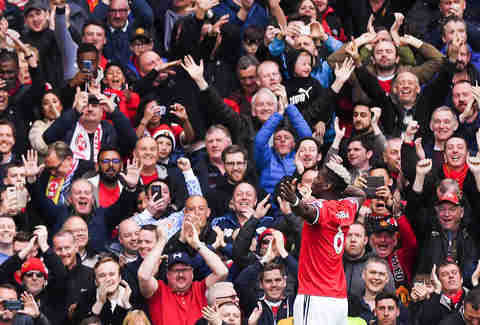 The English soccer season starts in August and ends in May, with domestic and international club tournaments played concurrently; it’s pretty easy to see three top-level games over seven days. I was there for two European Champions League games, finishing up with Newcastle United hosting Stoke City on a standard Premier League Saturday. If you’re still feeling that post-World Cup soccer buzz, I can’t recommend this more highly. Even without the emphatic expletives, it’ll have you feeling borderline spiritual. First stop, Old Trafford, home of Manchester United and one of the most famous stadiums in the world. I checked into the creatively named Hotel Football, which is well within cheer-shot of the stadium. It carries the soccer theme further than I could possibly imagine: Soccer trading cards paper the hallways and the shampoos and soaps in the shower come in jersey-shaped pouches. In every room, the mini fridge is stocked with free grape soda and Curly Wurly chocolate bars, for some reason. It’s a 10-year-old boy’s dream hotel. And, like I said, it’s right outside the Theatre of Dreams, which is all I cared about. From my room overlooking the stadium, drinking my grape soda, I watched fans at all hours taking selfies at statues of Bobby Charlton and George Best. Old Trafford is a draw, even when there isn’t a game; the stadium tours run regardless, and the (incredibly pricey) official fan store sells everything that can possibly be embellished with the Man U logo. The stadium itself is not as dazzling as its legend. It looks run-down, with rusting exposed girders (not the trendy type) and a dated, 1960s-shag-carpet kind of feel. The locker rooms, which you can see if you take the tour, are tiny and surprisingly bare, and even the VIPs have to make do with a ring of dingy lounges and suites around the pitch. Of course, none of this really matters when the trophy room is as well-stocked as it is, and certainly the supporters don’t seem to care. There’s a sense of overwhelming confidence, even arrogance, emanating from the Man U fans I got to talk to, along with the bigwigs who run the club: They think they’re better than everyone else. That night, they only had to be better than a team from Basel, Switzerland -- and they were, winning 3-0. The Belgian Marouane Fellaini, whose jersey I’d purchased in the fan shop, scored for the Red Devils. It was electric, even for someone on the shady side of 10. Old Trafford is outside the city center, where the best restaurants are; naturally I went into town for dinner. The place I ate, Australasia, was good enough for David Beckham and Wayne Rooney, although I found out later that Wing’s Restaurant, a Michelin-starred Chinese joint, is the true footballer hotspot. Also in the center city is the National Football Museum. “The best football museum in the world,” it claims. Well, it’s definitely the best soccer museum I’ve ever visited, although it is the only one, too. It’s geared for kids, but there’s also plenty for big kids to get excited about, from penalty kick competitions to a gallery of art about Pelé. The exhibits got me wondering about why the game is so popular, and how it evolved from kickabouts in the park into a global cultural monster. An effortless morning train ride got me to the mouth of the Mersey on the day of another Champions League game, Liverpool hosting Sevilla. The Americans who own the Boston Red Sox bought Liverpool in 2010 and looked into replacing the team’s historic stadium, Anfield, but decided to restore it instead. Good call. Anfield is modern in every sense, with comfy seats, nice sightlines and spiffy concession stands. Yet it still feels like a classic old park. It’s beautiful. Liverpudlians have a choice between two sworn enemies: Liverpool in red, or Everton in blue. I had no idea the two clubs were physically so close together -- just an easy walk apart, across Stanley Park. In the taxi to Anfield, the driver, loyal to the Reds, pointed in the direction of Everton’s Goodison Park, and joked that I should plug my nose to avoid its odor. 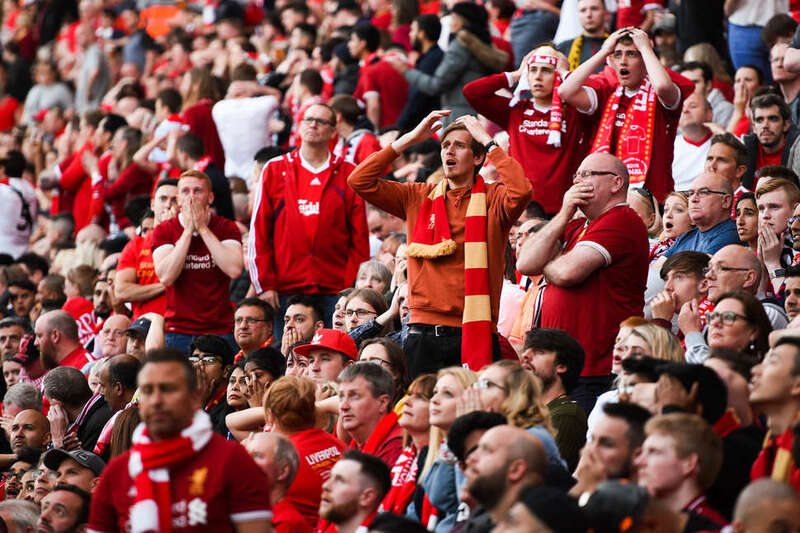 Certainly, Liverpool has enjoyed the sweet smell of success more often, especially in a golden era of 11 league titles and four European Cups in the 1970s and 1980s. I got to Anfield well before kickoff, so I dropped into the fan shop, which is nicer than the one at Old Trafford (please don’t tell the Mancunians I said that) and everything is a bit cheaper, too. I toured the club museum, which is mostly devoted to former player Steven Gerrard (they really like the guy), and learned the history of the old Carousel song “You’ll Never Walk Alone.” And then I heard it first-hand, sung by thousands of fans, with Champions League bunting fluttering in the air and neat rows of terraced houses in view outside. Goodison Park, so close by, sat dark. Television, I assure you, doesn’t do that song justice. After that, it hardly mattered that Liverpool tied Sevilla. I stayed at The Shankly, a hotel named after Liverpool’s legendary coach (first name Bill). 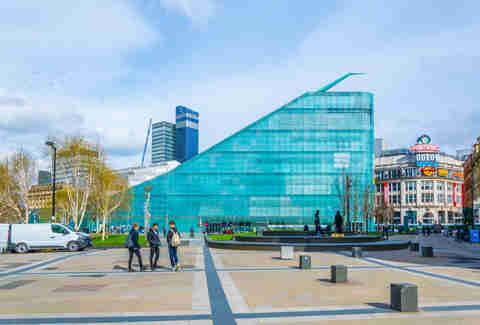 The best thing about it was the location -- an easy walk from Lime Street Station and handy for all the touristy sights. The hotel’s owners (apparently Bill Shankly’s descendants) have purchased the building immediately across the street and plan to open a second hotel, this time with an Everton theme. Sans odor, one hopes. I took the train coast-to-coast and arrived in Newcastle with a day to spare before the game. Manchester and Liverpool are fine cities for a stroll, but Newcastle may be the best of the lot. I walked from the statue of abolitionist Earl Grey down to the River Tyne, and explored the relics of the newer castle from which the city got its name. The whole city is named in this amusingly straightforward way. For instance, the gate through which prisoners were taken from the jail to be executed? That’s gallows gate. You’d think the poor guys would have guessed what was coming. Newcastle has two official cathedrals. St. Nicholas, affiliated with the Church of England, and St. Mary’s, an imposing Catholic church known for its stained glass celebrating the industrial heritage of northeast England. St. James’ Park, where Newcastle United has played since 1892, is known as the city’s Third Cathedral -- each Saturday, it becomes a place of worship. The stadium sits right in the heart of the city. It was expanded in the 1990s with the same exposed girders and pipes that make Old Trafford look so tacky. The whole thing comes off a bit better at St. James’; it’s still an erector set, but not annoyingly so. A few years ago, the current team owner tried to rename of the stadium after one of his businesses. The congregation of season ticket holders wouldn’t have it. St. James’ is theirs. 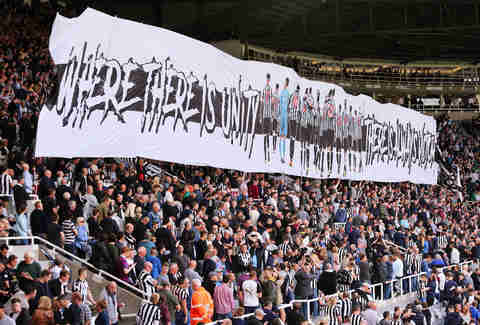 It belongs to Newcastle. Newcastle United Football Club is deeply embedded in the city’s culture. The day before the game there was a wake in one of the stadium’s private suites; a sign directed mourners to the Magpie Club and “A Celebration of Keith’s Life.” They give tours of St. James’ even on game day. I took one, and had the chance to be in the home team locker room maybe 15 minutes before the players arrived. All the jerseys and socks and cleats and shin guards were laid out. So too were sports drinks and gum bananas. It was kind of surreal, like walking around a Broadway stage right before they raise the curtain. I peered into American fullback DeAndre Yedlin’s locker. He will sit right there. He will wear those shorts. I slipped out before kickoff to a pub called The Strawberry, an almost mandatory pre-game stop that sells beer and cask ale. There’s soccer on the televisions, and a crowd that grows increasingly thick with fans clad in black-and-white stripes as noon approaches. Unlike the Champions League games in Liverpool and Manchester, this match wasn’t particularly on the radar. The opponent, Stoke City, is a classic mid-table team. They’ve got some good players, notably Swiss midfielder Xherdan Shaqiri, yet they rarely manage to compete for titles, or even spots in European tournaments. These days, it’s the same story for the once-great Newcastle United. Two years ago, the Magpies even dropped down to the second division. Now back in the top flight, games against teams like Stoke are vitally important. These are matches they can realistically win, and which they must win in order to avoid another relegation. A soccer game in person provides a thousand little insights. I liked watching the weather. On TV, Premier League games look so cold. Everyone in the stands seems to be wearing a black jacket. Huddled in my black coat and hat at St. James’, I watched the sky cycle from rain to sun to more rain to waterless gray clouds that made the action on the field feel somehow more dramatic. I knew the American Yedlin was an exceptionally fast and offensive-minded winger. It was something else to watch him make his runs up and down the pitch. A lot of his efforts would never have been shown on television, yet they were still central to his game. I knew Stoke’s Shaqiri was a short man, but until I saw him play in person I wasn’t aware just how wide he is. His body is like a square with legs and a head. He’s a SpongeBob with an amazing touch on the ball, and he scored a goal. Stoke employs a striker who used to play for Liverpool and the England national team, but is now past his prime: Peter Crouch. 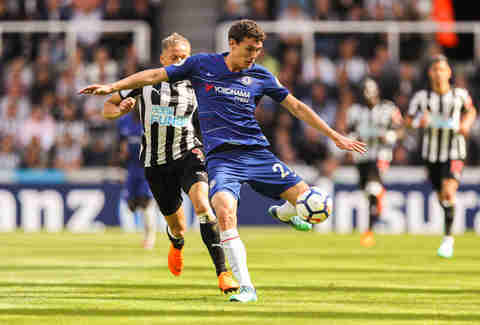 When he subbed on late to try to get Stoke an equalizer -- Newcastle had taken the lead, 2-1 -- I was awed by just how much of a presence he still claims on the pitch. He affected the game, even at this late stage of his career. Yet Newcastle held on to win. The whole game, start to finish, was so quick and focused. No time outs. No time wasting. After the final whistle, everyone quickly filed out to flood the city. Pints back at the Strawberry while watching the late game on the televisions. A meal at a restaurant down by the river, a tour of the big pubs alongside what seemed like everyone in this surprisingly young city. The Old George, a small cool place called the Crown Posada, supposedly purchased by a Spanish sea captain for his mistress. College students warbling Oasis with a busker on Grey Street. You never get that on TV. The game is so connected to the community. The people in the stands are as much a part of the spectacle as the players. It’s social. And even for an American with a guidebook in his pocket, it’s a hell of a lot of fun to join in. Robert Andrew Powell is a contributor to Thrillist.